Hey there! I've received a number of emails lately asking how I built my dining room table or how I attached the top to the dining room table I already had. So I decided to do a tutorial for all those who asked. I didn't take any pictures when I did it so I took pictures of the under side of the table, which many of you have asked for, and will do my best to explain each step. As I mentioned in that post, I used pine 2 x 8's. After I distressed the boards, process discussed here, I laid them together evenly and attached wood brackets to keep them all together. As mentioned, I already had a dining room table, I just didn't like the top, so I removed it and was left with the base. Now, the previous table was also built by me using the table legs that my dad turned himself before he died. I created the apron (sides) with pine 1 x 5's and attached them to the legs with "L" brackets, as pointed out with arrows. To make them a little more stable, I also drilled long screws at an angle into the legs from the apron. As you can see, it is really important to PRE-DRILL your holes as my wood split. After the base was complete, I placed it over the under side of the top. To secure it to the top, I cut scrap pieces of oak, which is a little stronger, cut them at 45 degree angles and placed them flush against the apron. I attached it with screws to the table top. Next, I pre-drilled holes into the end of the brace into the apron, where the arrow is pointing. Then drilled screws into the holes on both ends. Makes sure your screws are short enough to not go through to the other side of the apron, but long enough to go through the brace and into the apron. I think the screws I used were 1 1/2 inches. To also add stability, I drilled holes and inserted screws from the legs, at an angle into the table top, shown with the bottom arrow in the photo below. Flip it over carefully and you are done. I know there is probably a better way to do this but this is what worked for me, some of it I learned from my dad with another table that he built. He had the right wood joinery tools to do this, I don't, so this is the process that I use. I hope this is helpful to all those asking me how I did it. It really isn't hard, just a little time consuming and really the only tools you need are a miter saw and cordless drill. Diana, I found your blog through Pinterest and I just love it. Thanks so much for this tutorial. I love the idea of woodwork and building my own furniture but it's one of those things that seems so scary and that requires a lot of tools and equipment. This tutorial shows that's not true at all and it's inspired me to give it a try. Thanks! Love the table, thank you for showing us how you did it! I was just showing my husband your table yesterday, and he was wondering if it came with directions! You did such a great job with this...I pinned it immediately. Love your blog, keep those great ideas coming. Can't wait to do this. This is the easiet table tutorial I've seen! SOOOO very thankful you provided this tutorial! This is on my project to-do list as I have a table that I want to change the top of (it's oval and I want a rectangle/farmhouse top). I just wasn't quite sure how to use the old legs for the new table. Thank you so much!!! I've always loved your table!!! This table is BEAUTIFUL!! I'm soo impressed and want my husband to do this ASAP!! I have a table that I don't like the top and this would be the perfect solution! Question for you, did you apply anything to seal the wood on the top of the table? This is fabulous. I would like a rustic table without paying the price. My husband is very handy, and I know he could do this! Hi, new to your blog and you are amazingly fantastic, seriously all the projects I've looked at so far are like on my "I really wanted to do that" list. Thank you for the inspiration and the pictures to show my husband what I am talking about that I want him to do for me ha. Kreg pocket hole jig, not "hold". Proof reading schmoof reading. Did you stain the tabletop or distress it in some way to get that color? This is the table top a friend is making for me,please tell me the color and kind of stain you used for the top. Love it. What an amazing table...it was wonderful before but love the after even, more! Thanks for sharing your tutorial! I did "pin" this, hope that was okay! Hi, I love your dining room table! After looking at the price tags on dining tables in stores, I am thinking this is a much better alternative with a lot more style! I noticed that your table seats about 6. I was wondering if you could tell me what size you thought would be best to seat somewhere between 8 people and 12 people? On other websites, I've seen it mentioned to use about 24" width per person and 24" in room to back the chair up from the edge of the table, and therefore that a 8' x 4' table would be able to seat 10-12 people, but looking at your table, I'm not sure if that's a good estimate. Please let me know your thoughts! I am currently making this tabletop with my dad! He came up for a visit to see the home my husband and I are buying, and decided yesterday we'd build a table. We bought the 2x8's at Lowes - we found 10' for $6, so we asked them to cut 3 in half and we used 5 of the 5' lengths to create a table the perfect size for the new dining room. Yesterday we sanded and stained them "dark walnut" by minwax. Today we'll sand and assemble the top. My husband and I will hunt for the perfect base at yard sales tomorrow morning (Sunday) and thrift stores throughout town if we don't find what we want at the yard sales. If not, we found a tutorial on a DIY website to build a simple table base. Thanks so much for sharing - this will be a special piece for my family. I love this table! You inspired me to look for funky yet cheap tables on Kijiji. I wont be making it from scratch like you did. I will simply sand and paint the table and slap on the 2x8 boards and screw them on from underneath. I can't wait! How long were the table legs that you used? I can't seem to find any that are long enough. Love this table! Making my list right now to send the hubster out in the morning to pick up lumber! Any chance that you can let me know your cut list on the pieces for the apron? Also, my HD and Lowes only have 1x4's and 1x6's as options for the apron. Any recommendations? I adore your table! Thanks for the tutorial, I'll have to remember this one. We are moving into a new place that has a HUGE kitchen in need of a HUGE table. Hi, i was thinking a kreg jig would be a great addition for uou! We have one and it makes woodworking SO much easier and stronger, simple little thing but an awesome tool!! I have three 10 foot x 12 inch cypress boards. I want to use the table outside on the patio for summer meals (big fam). Before I start the project, do you think this would hold up outside? Love your blog! Can't stop pinning your stuff! What color is the paint on the walls? I love your table. Looks amazing! I love it so much my husband and I made one similar following your tutorial. Thanks for the inspiration and wonderful tutorial. This is a great site and I love your table, you did such a good job on it. 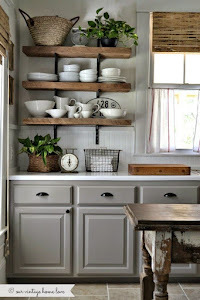 I love the country style look with old rusted wood interior. We just bought a antique dinning room table that I wanted to re-do. I have been looking for different table bases to use. After seeing yours, I think I may go with the old wood and white frame. I have also seen table base ideas such as using tree trunks and big tiled pots. I think those ideas are for a more contemporary style but I really like the country look. I used your tutorial on my coffee table! I had to tweak it a bit, because I didn't find your post until I had already made the top. Thank you so much for sharing your method! Moreton Fig Restaurant is conveniently located in the center of campus in the Ronald Tutor Campus Center. The stylish, vibrant restaurant features an open kitchen, full bar, private dining room, and outdoor patio anchored by USC's historic Moreton Bay Fig Trees. The menu focuses on seasonal farm-to-table cuisine with options to suit students, faculty, administrators and the public alike. Please call (213) 821-3441 for more information. I'm a little confused. Did you take off the original boards and replace them with the new ones you stained? It's so beautiful and I'm trying to get the same exact look on my table!! LOVE this!!! Exactly the direction I needed to get my project rocking. Thanks so much!